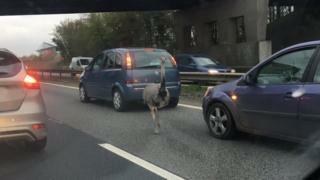 A rogue ostrich caused traffic chaos when it wandered on to a busy road during rush hour. The flightless bird was spotted casually strolling along the A12 in Essex, near Colchester United's stadium, at about 17:30 GMT. Lengthy tailbacks were reported in the area as motorists slowed down to avoid the animal. It is not yet known who the ostrich belongs to or how it managed to get on to the road.